Peggy Holmes began her choreography career working under such accomplished choreographers as Kenny Ortega and Michael Peters, assisting them on numerous feature films, television and stage productions. Peggy received her first solo choreography opportunity on The Fabulous Baker Boys. She designed and choreographed the famous Michelle Pfeiffer "on top of the piano" scene which turned out to be the highlight of the film, its image used topromote the film. Peggy then worked on Disney's feature film musical Newsies as the choreographer and special assistant to the director, her mentor Kenny Ortega. Peggy choreographed and trained the performers, assisted with the pre-records and oversaw the first assembly of all musical sequences. Kenny then asked Peggy to choreograph his next feature film, Hocus Pocus, starring Bette Midler. Other credits include Wayne's World, I Love Trouble, Father of the Bride II, A Very Brady Sequel and Deep End of the Ocean. Peggy also worked with Bette Midler on her 1993 Emmy Award winning performance in the CBS production of Gypsy. In 1998, Peggy received an Emmy Award for Outstanding Achievement in Choreography for her work on MGM's syndicated series Fame LA. She also served as choreographer for the first two seasons of the Fox hit, American Idol on which she staged the production numbers for the contestants. Peggy's distinguished career also includes impressive live stage credits. She continued her association with Kenny Ortega as his assistant director on Michael Jackson's 1992 Dangerous World Tour and Michael's 1996 History World Tour, in addition to Barbara Streisand's Millennium Concert Timeless. She also directed and choreographed Ben Vereen's 1993 national tour. Most recently Peggy was brought back to Disney to choreograph two musical sequences in the animated feature Jungle Book ll. 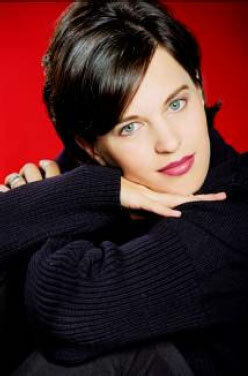 She was then given the opportunity to direct and choreograph an animated short for Minnie and Daisy, Belles on Ice. Inspired by a day on the ice with Michelle Kwan, Peggy took these classic characters and introduced them to the world of ice-skating. Currently, Peggy is directing her first animated feature for Disney, The Little Mermaid: Ariel's Beginning. What is your favourite Disney Classic and why? Peggy Holmes: The Lion King. I love the story and the idea of family and that family is the most important thing- Simba has to find his way back to his family. Tell us about the Disney Vault and what is happening with it at the moment? Peggy Holmes: Just getting ready to pull three classics back in, Peter Pan, Little Mermaid and the Jungle Book. So hurry out and buy these classics before we get them and pull them back into the vault for seven years. In the seven years they are in the vault we look over them and restore them to the best of the technology at the time. We make sure they have the best colour and animations and have them organised, ready for the future, so they can be changed with innovative technology. Which do you enjoy more choreographing or directing? Peggy Holmes: That's a very hard question. I am a dancer and have been since I was nine years old, dancing is in my heart. Dancing is like directing an animation because you have to look at the characters physical life. Peggy Holmes: A great team, lots and lots of people - it is like a team sport, everyone has the same goal. There are lots of different ideas and people: music, artists with ideas, artists that draw, artists that work with me on the storyline, we ask questions such as What would Tinkerbell do if she was in this situation? It is very fun and there is a lot of creative input and creative arguments- that is how we come up with the best ideas. Peggy Holmes: Tinkerbell. I can't give away any of the storyline, but I can say it is set in Winter. Each year the Disney Vault opens to release exclusive Walt Disney Classics on DVD. The prestigious nature of these Classics means that they are available for a very limited time only. In fact it could be up to seven years before you see these Disney Classics on DVD again. 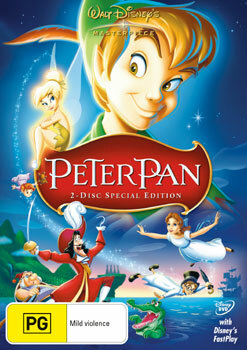 If you've ever dreamed of staying young forever, then it's time to be whisked away to the magical world of Neverland with Peter Pan on 2-Disc Platinum Edition Disney DVD. Peter Pan, Tinkerbell, the Lost Boys and the children take you on a magical journey filled with fun, dreams and adventure including all new, digitally restored sound and vision. Set in London, the tale begins when Peter Pan and his best friend Tinkerbell fly through the Darling's nursery window and meet Wendy, John and Michael. Taking an instant liking to Wendy, Peter invites the children to accompany him to the magical world of Neverland, to help take care of his gang of Lost Boys. Once they learn to fly, Wendy, John and Michael soon begin to adapt to life in Neverland, which is excitingly free of grown-up rules. However, Peter Pan soon finds himself up against the notorious Captain Hook and the swashbuckling pirates, where he quickly unravels the secret danger and action of Neverland. With a touching story and unforgettable music that will stay in your heart forever, Peter Pan is a must-have DVD for the whole family! Originally released in 1967, and inspired by characters from the classic Rudyard Kipling novel, The Jungle Book is one of the most popular Disney films ever, and is the last to feature Walt Disney's personal touch. 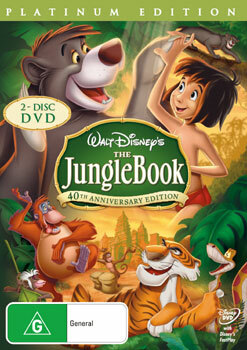 Teeming with sprightly characters including the wise panther Bagheera, happygo- lucky bear Baloo, and the menacing tiger Shere Khan, this beautifully restored Platinum Edition DVD will have the whole family singing along to unforgettable Disney classics including The Bare Necessities and I Wanna Be Like You. Swing into a jungle of fun in this 2-disc Platinum Edition DVD with all-new bonus features. Meet the long-lost character, Rocky the Rhino, and experience never-before-heard deleted songs, all-new games and much more! Relive all of the romance, adventure and music in a fully restored special edition of Disney's most requested animated films, The Little Mermaid. Ariel, the mischievous and playful mermaid is joined by her friends Flounder and Sebastian, the reggae singing crab, in a story that follows her adventures from the deep blue sea, to the mysterious, wide world of humans. After saving the handsome Prince Eric from drowning, Ariel becomes transfixed and mesmerised by all that the land of humans has to offer, and decides to follow her heart and woo her human Prince. In order to transform herself from mermaid into a human, Ariel strikes a deal with Ursula, the Sea Witch, and agrees to give up her beautiful voice in order to join her Prince. But Ursula has another plot up her sleeve, and the adventures really begin when Ariel must race against time to win the heart of her Prince and save her father, the King of Triton's, underwater kingdom! 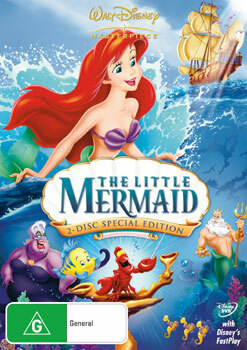 With original music composed by Alan Menken and Howard Ashman, The Little Mermaid was the recipient of two Academy Awards for Best Original Score and Best Song, 'Under The Sea', as well as two Golden Globes for Best Song and Best Score. Brimming with charm, The Little Mermaid is full of fun, adventure, unforgettable characters and legendary songs - all of which have combined to make it one of the most popular films of all time. The jewel in the crown of Walt Disney movie history, Snow White and the Seven Dwarfs was originally released in 1937 to critical acclaim and an adoring audience. Alive with magic, suspense and adventure, this family favourite begins when Snow White's jealous stepmother consults her Magic Mirror and furiously discovers that Snow White's beauty surpasses her own. To save her life, Snow White must flee into the forest. Taking refuge in an enchanted cottage, Snow White changes the lives of its seven lovable residents - Dopey, Sleepy, Sneezy, Bashful, Happy, Doc, and Grumpy. But even their devotion cannot save Snow White from the Queen's evil spell.